I recently introduced my good friend to the RockTail Hour at RockSugar Pan Asian Kitchen, and she simply yet so eloquently summed up the essence of what this happy hour is all about. She stated: “For the price point and the drinks, what more could you ever ask for, especially in this ambiance?” I blinked back the tears forming at the corners of my eyes. I was just so elated that she got it – she understood. I want you to get it – to understand – too. On any given night, dinner with a couple of drinks can easily run you $60 per person. So when the weekday Rocktail Hour rolls around, and instead of $60, I’m averaging $24 – for the same award-winning dishes, the same invigorating drinks and the same gorgeous setting – do you see why this place, no pun intended, truly rocks? Prices are slashed significantly. Rocktails are no longer $12; they’re now $6. And most appetizers, which normally average around $12, are now a shocking $3. A trip here is worth every single quarter, nickel and dime you’ll spend. The selection of regional dishes from Thailand, Japan, China and India are brought exquisitely displayed to the table, and taste just as tantalizing as they appear. Secondly, the Rocktails (i.e., cocktails) are killer. Case closed. Revitalizing, rejuvenating, generous with the flavor and alcohol. And finally, the space is visually captivating. 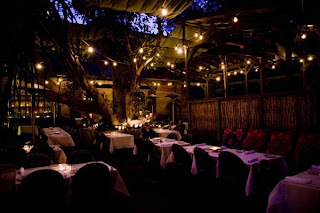 From the moment you step through the majestic wooden doors to emerge into the front patio areas, it’s as though the congested L.A. jungle has vanished, replaced by a serene oasis. Next time you're in need for a Rocktail, you know where to turn! PICTURED BELOW: The Tamarind Margarita and the Crispy Sweet-Hot Shrimp with tempura eggplant. Other appetizers I recommend are the Chicken and Mushroom Lettuce Wraps and the crispy chicken samosas. PICTURED BELOW: The lovely Orchard Road Martini an insatiable vegetable flatbread. This martini is less potent, more pretty to look at. If you’re looking for a stronger drink, I’d try the Tamarind Margarita or the Bourbon Sling. PICTURED BELOW: Sitting on the front patio is a must. In every corner, at every direction that the eye can see, hand-picked artifacts from distant lands adorn the indoors and outdoors. One bite into an O!veggie burger and you will see the light. You will instantly understand how a veggie patty was intended to taste. You will realize that for all these years, that bland, mushy gunk you’ve been eating has been a poor imitation of the real deal: a patty with corn, spinach and other scrumptious vegetables that you can see and taste. That’s precisely the goal of O! Burger: to bring much-needed freshness into the grey, mundane fast-food industry. Priding itself as Los Angeles’ first organic fast-food joint, it specializes in making burgers, hot dogs and other American classics (like chili) that have no food coloring, steroids or other modifications. In fact, co-owner Andy Soboil is more than ecstatic to discuss how healthy those French fries you’re ordering are. Even if that order includes a dose of organic ketchup. With fries come burgers — veggie, beef or turkey — that are stacked so high with cucumbers, onions, tomatoes, lettuce, pickles and cheese that they look as if they’ll threaten to topple over at any second. A variety of organic beverages, like the O!vegan shake made with oat milk or one of the kombucha teas, will quench anyone's thirst. 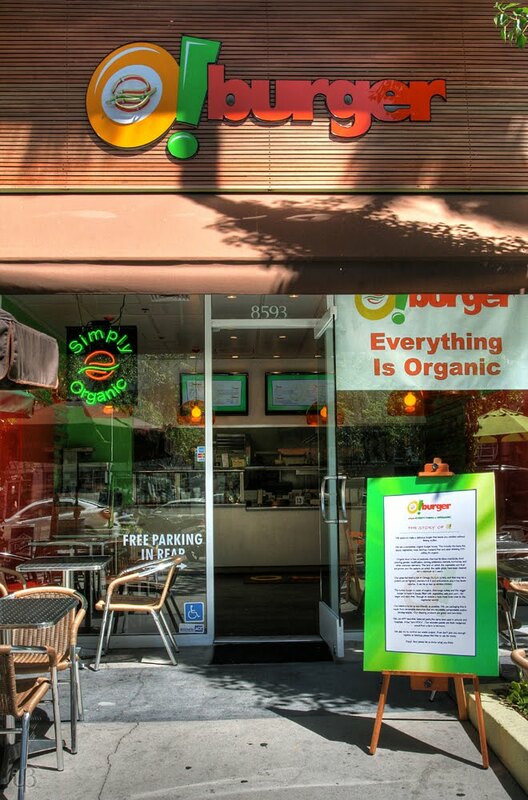 Next time you’re in the West Hollywood area, you know where to stop for a quick — and healthy — bite to eat! PICTURED BELOW: The Very Vibrant O!veggie burger. Tastes as good as it looks. PICTURED BELOW: The delightfully refreshing kombucha tea complements any burger and fries. PICTURED BELOW: O! Burger’s interior is as bright and colorful as its food. 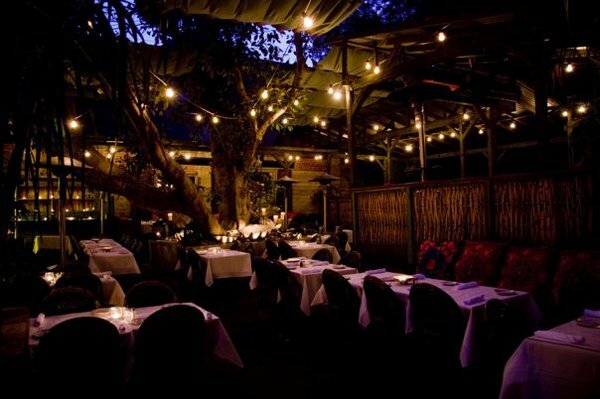 Dining options are available both inside and out on the front patio, which happens to be a great centralized location to people-watch on Santa Monica Blvd.